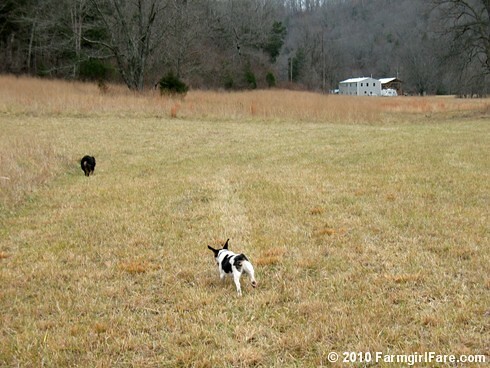 © FarmgirlFare.com, the airborne foodie farm blog where that is indeed a new beagle puppy (!!!) you see flying through the hayfield (and who is now sacked out about five feet from my desk, even though he technically lives outside). I'll formally introduce you in a day or two, but I couldn't resist posting this picture of him launching himself—as only a puppy can do—into the new year. Hopefully this will be the one where we finally move into the new building you can see in the background that we've been working on for nearly eight years. But if The Shack falls down around us before we make the move (you think I'm kidding), there's always the new (to us) little 'guest cottage' parked right next door to our future home. It's good to have a backup plan—and a puppy. Happy New Year! Too cute and too funny! I miss having a puppy around. Beagles are wonderful dogs...and they are the cutest puppies. We had one who lived to the ripe old age of 14 and I could write a book about his crazy antics. What fun...and crooning...you are in for! But, you already have donkeys braying so crooning will not be a problem. Good luck with sweet flying pup and happy new year! We have a new beagle pup. She is a hoot. Right now, she has crashed on my feet. We are constantly laughing at her antics. Except for today when she snatched my knitting and proceeded to make a big snaggled yarn ball. Happy New Year to everyone on the farm. PUUUUUPPPYYYY!!! I love other people's puppies (though I think I could do without ever having another of my own). Details soon, please! I love the energy that puppies seem to have. Then once it is spent the collapse into a sound sleep. What a great building. Our barn really needs help. Another project for another day. Happy New Year! A new puppy??? What a wonderful way to start the new year!!!! Congratulations to all of you!! Cannot wait to read all the details and see LOTS of pictures!! Oh yay! A new puppy! (I gave myself a new one from the shelter last New Year's-just the best way to get through winter I can think of) Post pictures soon!!!!!! My grandad raised champion beagles, and I used to have three of them. I love beagles. And I miss puppy breath. That is just the cutest picture. And good luck on the move- hope it comes soon. I can't wait to read more about your beagle pup....I love beagles, and have one myself. So sweet it must be to be at your farm right now! He's adorable and the new house is stunning! Congratulations and happy New Year! Aw, can't wait to see more of the new beagle baby!